“The crisis will burst out all of a sudden” (p. 239). “Fire from heaven will run across the earth on a terrifying width . . .” (p. 66). Coronal Holes create solar flares which are MUCH faster than those solar flares caused by Coronal Mass Emissions (CME's), which take days to be completed. Coronal Holes have magnetic fields in their super fast emissions, and these magnetic fields will trigger earthquakes. Severe earthquakes can trigger volcanic eruptions as far as 500 km away from the earthquake's epicenter, according to a new study coming from Chile. A volcanic eruption caused this blood-red cloud to amass. “within a very short time, the sky will be covered with a cloud of blood. My children, the sky will be covered with a cloud of blood and the sunrays will be darkened from it. It will be pitch-dark and never will darkness have been as thick as during those three days of rainfall, of mourning, of agony and death"
“My children, rest in My peace. I am going to prepare a shelter for you. Henceforth time is up. I will shelter you under a clear and bright sky, but the sun will soon darken its rays. The signs of My Justice will cause death to the plants on earth. The green meadows will produce no fruit: torrents will turn dry: not one drop of water. Sand will be burning. Such a punishment is awaiting the surroundings of the place of the Cross, in the South. . . . I will protect and preserve those who will be bound to wait for a little while before they find a refuge under the Divine Tree of the Cross. (pp. 58-9). "Major volcanic eruptions have additional climatic effects beyond global temperature decreases and acid rain. Ash and aerosol particles suspended in the atmosphere scatter light of red wavelengths, . 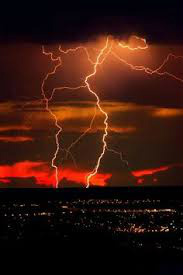 . ."
“From a pile of fire-red clouds, lightnings will burst out zigzagging and devastating, setting fire and turning everything to ashes. The air will be filled with toxic fumes and deathly vapours. . . tornadoes . . .” (p. 44). 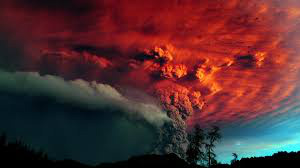 [Volcanic eruptions give off as many as 9 poisonous gases]. “I see in my sun a black and blue rainbow at least two metres in width . . . From that rainbow, a rain is falling, . . .a blood red rain is falling. On the roofs of the homes, it is left sticking like paint; on the ground it cannot be sucked in. It falls down with a frightening speed. “In the midst of that rain, a terror is produced: a cross takes shape in that rain carrying the imprint of a Christ. . . . The yelling of the just is frightening. . .
“After three days, the rainfall from the rainbow spreads out visible throughout the whole universe” (p. 241). This blood red rain, falling after volcanic eruptions, will be very acidic (as will the air itself) and may burn skin, eyes, and perhaps lungs if breathed in. The deaths may be from the alveoli in the lungs bleeding from these chemical burns, so that one "drowns" from the blood in one's lungs. “A rainfall of blood will fall upon the earth which will have your crops drying up. And on that year, the earth will produce nothing. 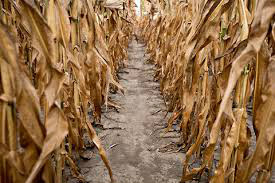 In Brittany, I will leave half the harvest” (p. 242). 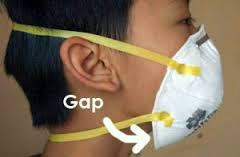 To go outside, an N95 mask is good, but make sure there are NO gaps! It will be wise to wear goggles also. 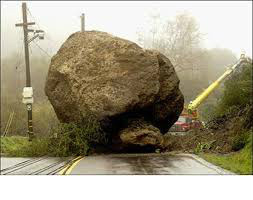 Boulders of different sizes will be falling in mountainous areas during the long severe shaking. “. . . the most deeply rooted trees will be staggering” (p. 242). “The earth will quake from this place, up to the sunrise, for the length of six days. One day for resting then, on the eighth day, the quaking will be resumed. . . . 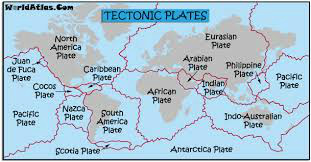 The earth will be quaking so hard that people will be thrown 300 steps away” (p. 274). 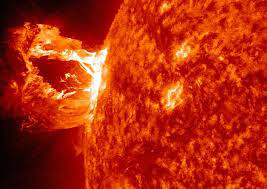 Magnetic fields from the extremely fast solar flare caused by a Coronal Hole can trigger earthquakes. “. 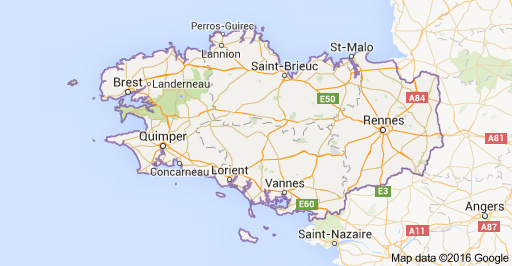 . . there will be a kind of separation, a separation between Brittany and the border adjoining it” (p. 242). “Brittany will be covered with a white veil. But she will also experience her three days of mourning . . . but the storm will be less violent upon her than in any place elsewhere" (p. 242). "That part [Brittany] will receive blessing from Heaven. It will be generously protected" (The Blessed Virgin Mary, speaking to Marie-Julie, p. 236, Prophecies of La Fraudais). 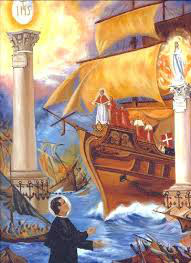 Notice the fiery object in the sky of this famous painting of St. John Bosco's dream of Holy Mother Churh in the End Times. "Thanks to an excellent work of the sun, the earth has nourished the devoted flock of a most holy shepherd -- our very Holy Father Gregory XVIII, a priest altogether admirable." ( p. 175, The Prophets and Our Times, by Rev. R. Gerald Culleton).